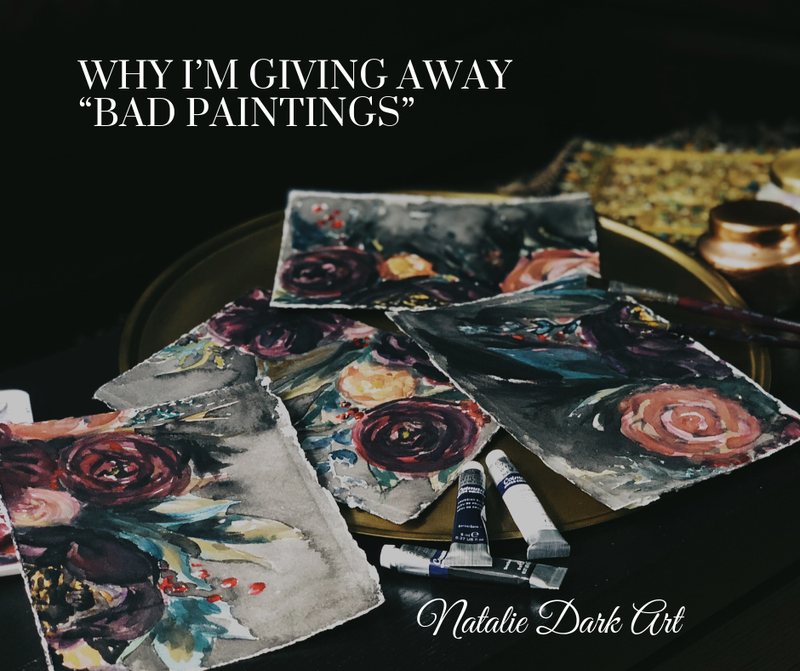 Why I'm Giving Away "Bad Paintings"
When I first shared my watercolor paintings with the world it was on Instagram stories, and I said they weren’t good. So why would I ever make that the piece I decided to giveaway?! Well, the short answer is because I was wrong. First of all, there is no such thing as good and bad in art. And I am actually embarrassed that I used those words to judge my own work, let alone in public. It literally goes against everything I stand for and believe when it comes to art. And second of all, because I actually LOVE that piece. Because so many of you sent me DMs to tell me that you disagreed, and that you loved what I had done! Because you called me out for being un-supportive of my own process, and you helped me be more open to appreciating the different sides of who I am as an artist. And because I actually LOVE these pieces. When I said they weren’t good, it was because I thought my watercolor paintings would be judged by the same metrics as my colored pencil drawings. My colored pencil drawings are detailed and extremely realistic, which is the exact opposite of what my watercolor paintings could be described as. 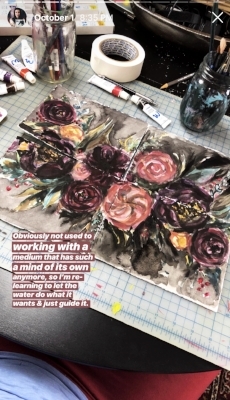 So by those standards, the watercolors aren’t good. The watercolor paintings are messy almost to the point of abstraction, which is exactly what I LOVE about them. There is a deep sense of intuition and emotion and freedom in these watercolors. Back when I used to paint with watercolors very frequently, I was a different person. I was much younger (it’s been over 10 years! ), life has changed A LOT since then – I have changed a lot since then. Yet for some reason, I thought my watercolor style would have remained the same. If you follow my IG stories, then you may have an idea about how absolutely confused I was when my style turned out to be completely different. At one point I even said it felt like torture, and it did, because I was trying to paint the way I did all those years ago. I was trying to be someone else. So after describing it as torture, I decided to give it one more try, but this time I would have no expectations, I would not think, I would just create. And it flowed. And it was messy and intuitive and chaotic and organic. I took the effort out and replaced it with intuition. It was liberating, and the end result was BEAUTIFUL. I see my life in this painting. I see the times of chaos and stress and pressure in the parts that are extremely dark and nearly overworked. I see the times of relaxation and simplicity and calm in the parts that are lighter and almost untouched. I see my life in the way these areas flow into and out of one another. But I almost dismissed it. I almost limited myself and my potential to the one side of me that creates detailed and extremely realistic colored pencil drawings. I was ready to conform to what I thought society wanted from me; to what society had validated and deemed desirable. But you stopped me, and you didn’t let me take the easy way out. You didn’t let me simplify who I am. You didn’t let me focus on the highlight reel. You told me you wanted to see it all and you supported my process. I have always wanted to share my process in its entirety, the highlight reel, the blooper reel, the behind the scenes, the finished products, the outtakes, EVERYTHING. But that is REALLY scary, and especially so when you’ve already got something that you know works, because you are so tempted to just hide behind that. But I didn’t start doing this for the likes, or the followers, or the validation. I started this as a way to stay accountable to myself. I wanted to create more & share my journey with the world. And I almost lost that. But you guys helped me stay open & helped me feel comfortable enough to lean into the process. So that is why I decided to giveaway these paintings. Not just because I think they are beautiful in their own right, but also because I can’t think of a better way to say thank you for supporting my journey than to actually share such a meaningful piece of my journey with you.